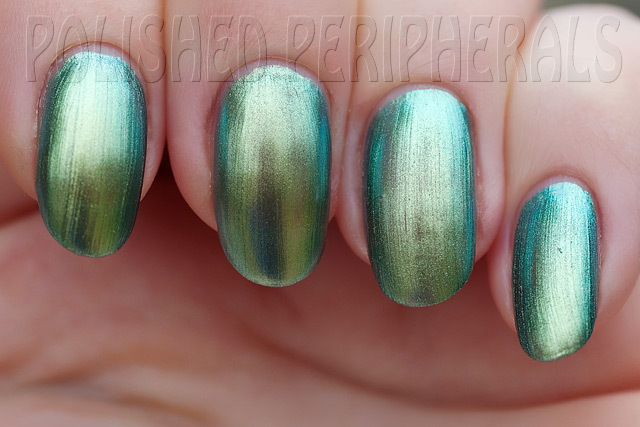 I had a request for comparison swatches of some of the polishes I showed in my Ozotic Scatter Chrome 915 post here. 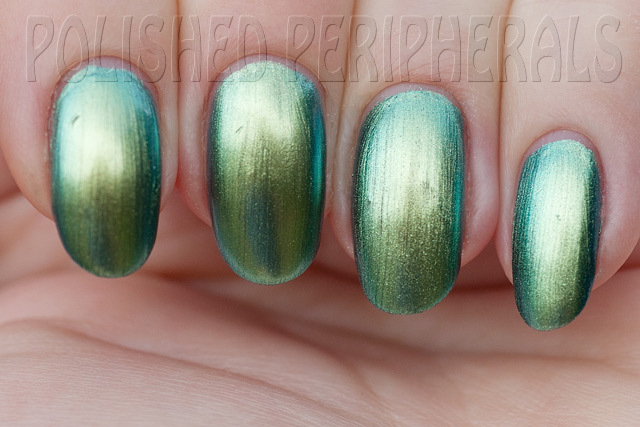 So scroll down if you just want to see the swatches and skip my babbling about Halloween. Did everyone have a fun Halloween? We don't celebrate Halloween here but it seems each year there's been an increase in the number of kids trick or treating in Australia and in the new area we're living in there's more kids than at our old house. 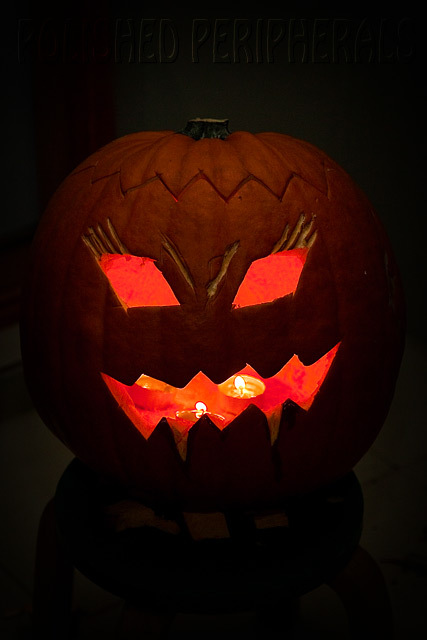 Last year we carved a pumpkin and handed out lollies to any visitors we had. This year we were more prepared, we even saved the pumpkin seeds from last year to grow our own. Unfortunately we didn't plant early enough so our pumpkins aren't ready yet so we had to pay $23 for a pumpkin to carve :( Our pumpkin had vampire fangs with Sally Hansen polish for blood. I tried to carve some details but next year I'm going to find a better pumpkin tool than a cuticle cutter. The kids wanted to dress up and were very excited. We put our pumpkin out the front so the trick or treaters could see we were participating and waited with our front door open. We also had Alex's huge dalek on display, a remote control spider and a fog machine which we turned on with a quick press of the foot when ever someone came to the door. The kids loved handing out lollies and we had some very creative costumes come to visit. There were also a few older kids without costumes who were obviously just trying to get lollies without getting into the spirit of things. All the young kids were escorted by adults and the highlight for Alex was when one of his class mates turned up. My parents came over for dinner to join in the fun and when they'd had enough of handing out lollies, the kids went and did their own door knocking with their dad. I didn't get to do my Halloween nails I'd been planning :( My parents came over early because I'm helping Dad design a book to print, so it was a pretty hectic day and I just didn't get any nail time. 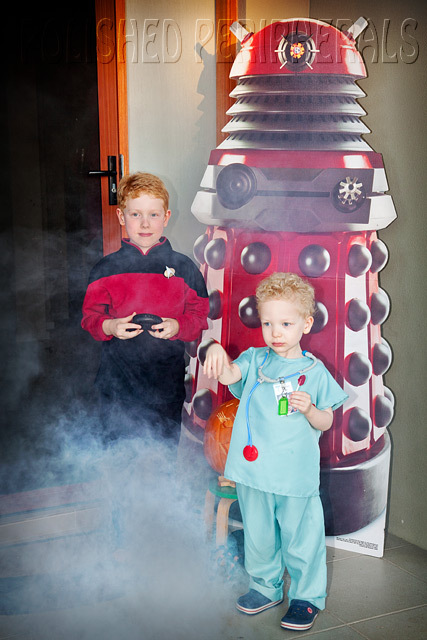 Star Trek Captain Alex, Dr Ben (with a broken wrist) and a dalek. 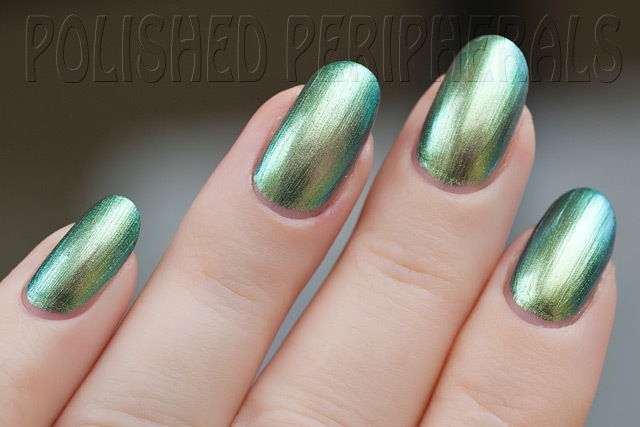 So here's a quick comparison of Nails Inc Swiss Cottage, China Glaze Unpredictable, Missha HGR01, Peripera Metallic Green P027 and the Ozotic 915. 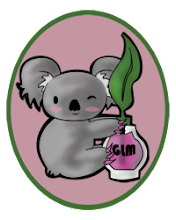 I left out Misa The Great Green Whatsit because it's noticeably bluer. This was two coats of each (no top coat) and they all need another for even coverage except Ozotic 915. It's hard to tell from the photos but I can see my nail through them all except the Ozotic. Any lines you see are brush strokes, not nail ridges. The Chine Glaze was the sheerest. The Missha and Peripera might have been OK with two coats except I had some dragging from their brushes which left uneven coverage. I paint fairly thinly so anyone who does thick coats might get away with two. The Ozotic is definitely unique here. 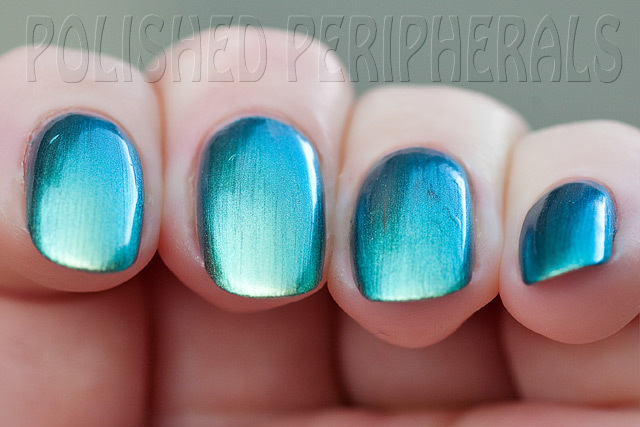 The scattered holo particles set it apart from the other polishes despite the colour similarities. It shows less brush strokes and covers better. At this angle you can see the beautiful blue colour shift. I couldn't pick a difference between the colours, all polishes looked the same to me. If I hadn't made notes of which was on each nail I would never have been able to tell. I guess that means I don't need to keep all these. Working out which to get rid of will be tough. It's a colour I love and it's like having to chose a favourite child (except that I could never do that). Obviously the Ozotic 915 is a keeper, it stands alone and I'd like to keep one of the others for when I want this colour without the scattered holo of the Ozotic. Which to keep? Well I prefer the finish on the Nails Inc and China Glaze. The China Glaze is just a bit sheerer than the Nails Inc but also just a tiny bit less brush strokey. It's also a bigger bottle at14ml vs 10ml for Nails Inc. Then I like the wider brushes on the other two better, and of those the Peripera is the better brush. The super cute Peripera bottle is worth keeping just to look at :) Missha and Peripera are also scented and it's a pleasant scent (at least to me, not like the Revlon Fizzes). The scent is still subtly noticeable after a few days of wear. There's no chipping from any of them and just a tiny bit of tip wear on the China Glaze, that's without top coat. I rarely get chipping from polish though, especially since I started using a gel hybrid polish as my base coat. The base coat also gives me a very smooth surface so there's no nail ridges, just brush strokes.